You don't need special tools to make this storage shelf. The shelf is assembled using square and diagonal lashing knots and the only tools you need are a sander, a saw and the painting equipment. If you find it difficult to follow the instructions below, there is a video at the bottom of this page that shows you the step-by-step procedure. A sander plus assorted sanding pads. 1 Cut the dowels into the required lengths. You will need  of 400mm - shelf supports,  of 1600mm - sides, and  of 1960mm - back. You can cut the lengths to size with a handsaw, or use a jigsaw or mitre saw if you have. 2. Sand all the cut pieces in advance so they are nice and smooth. 3. You also need to cut - or have cut to length -  laminated pine shelves 250mm wide x 1200mm in length. Sand smooth once cut. 4. If you are painting the shelves, wipe to remove any dust and then apply your choice of paint. If applying a sealer or varnish it's also a good idea to do this before you assemble the shelf unit. 5. 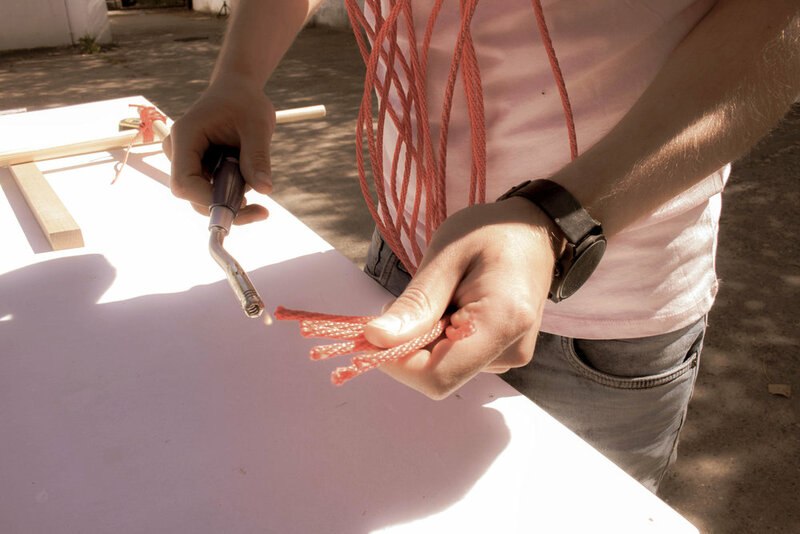 Use a lighter or blowtorch to lightly singe the ends of the nylon rope to prevent it from unravelling. 6. 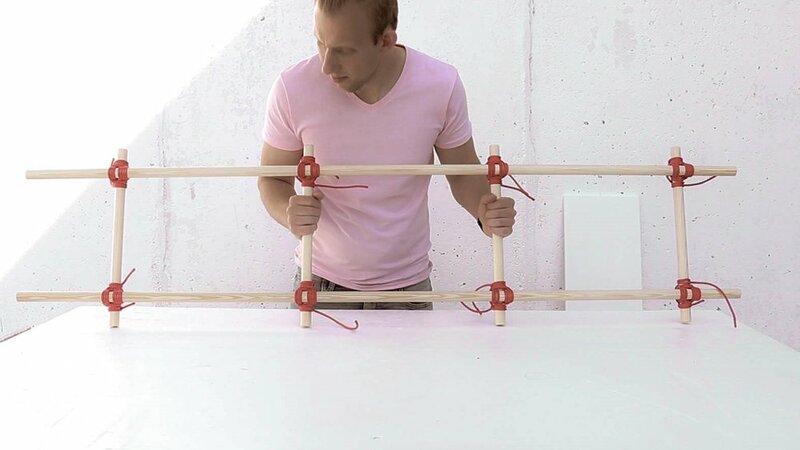 To make the one side of the shelf, join the  longer dowels together place a smaller dowel (shelf support) between the two longer dowels and secure using a square lashing knot. GOOD TO KNOW: The first (top) smaller dowel shelf support is secured at 200mm down from the top of the longer side dowels. GOOD TO KNOW: This knot ensures a secure fastening method. See the diagram above for how to do a square lashing knot. 7. Continue adding the dowel shelf supports every 400mm and then repeat this for the remaining side section. 8. Now connect the two sides of your shelf with two crossed sticks using Japanese diagonal lashing knot. Hint: you might want to ask somebody to hold the sticks while you are tying the knots. Completed side section joined together with square lashing knots. 9. Once the main frame is assembled, join the two sides of your shelf together using diagonal dowels (at the back) secured with diagonal lashing knots. Use a handsaw (or jigsaw or mitre saw) to cut the back dowels at a diagonal at the ends. 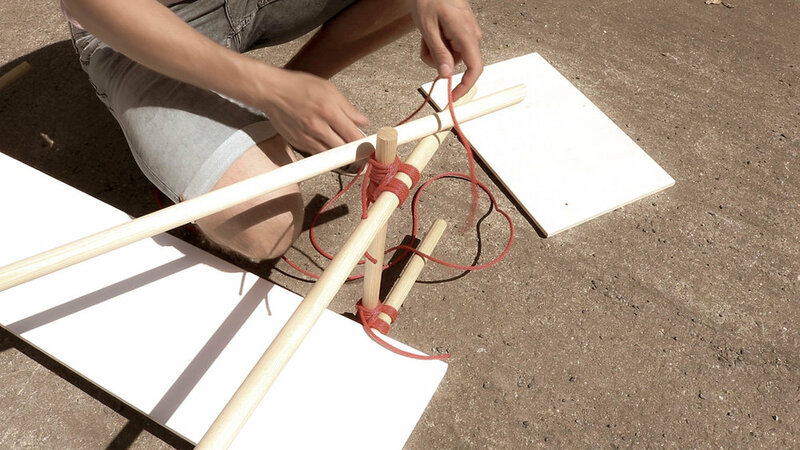 GOOD TO KNOW: Have someone on hand to help by holding the dowels as you secure with diagonal lashing knots.